Luther said, "hereditary sin is truly sin and condemns to the eternal wrath of God all those who are not born again through baptism (infant baptism) and the Holy Spirit." Most have never really studied "inherited sin" and don't understand the implications. People will sometimes study and understand the implications of inherited sin. Instead of rejecting it as false doctrine, they continue to believe in hereditary depravity, but deny that babies are born destined for hell. When this happens they are not being honest and are usually suffering from a conflict between their heart and their head. By the Bible's own definition, if man is born "spiritually dead" he is lost. All churches that teach inherited sin, apply the expressions under the "Lost-Hell" column to newborns: How can any of these churches apply these terms to newborns, yet maintain newborns are saved? A person can "vote by proxy" at a shareholders meeting he doesn't attend through another person he has authorized, that does attend. Faith by proxy is where someone else's faith, saves us when we have no faith of our own. The parents, by proxy, make a commitment on behalf of the child to serve God. B. The personal faith of godfathers and godmothers is considered an acceptable substitute for the faith a newborn lacks. A "Dedication ceremony" is where the child is dedicated to God through the parents. What becomes of the newborn, whose parents are atheists? Is one child saved and another lost solely on the basis of something the parents do? What if the Godparents are unfaithful does the newborn suddenly become lost again since its faith was based upon the Godparents? D. If the faith of an adult can substitute for that of a child, why can't an adults faith substitute for that of another adult? Many people believe that they will go to heaven if their spouse, parents, grandparents etc are Christians when they are not. They feel that their loved one or relative will "put of good word in for them" or will "hold the doors open for them". This too is faith by proxy. Most churches practice infant baptism in order to remove inherited depravity, the guilt of Adam's sin and most importantly to change their eternal destiny from hell to heaven. The Catholic and Lutheran church openly teaches that newborns that die without being baptized will go to hell. Imagine two newborns, one day old, lying in incubators. One has a priest sprinkle water on it but the other's parents were atheists and did not. Then both babies died, the unbaptized newborn would be cast into hell for all eternity but the baptized one would go to heaven. Although offensive to many, they are being entirely consistent and honest with the implications of inherited sin. They have merely taken the doctrine to its logical end. Those who believe "inherited sin", but don't like this conclusion, should come to their senses and entirely reject the teaching as false. There are no commands or examples of infant baptism in the Bible. If infants are lost from conception then God never made any provisions for forgiveness of their sins. A note about Pentecostal, Christian & Missionary Alliance, AGC: They correctly do not practice infant baptism or sprinkling, but incorrectly teach that baptism is not essential to forgiveness of sins (Acts 2:38; 22:16; 1 Pe 3:21; Mk 16:16). Yet it is a puzzle how they can teach that infants inherit "spiritual death" from Adam and are "separated from the life of God" but will be saved in this condition. They teach inherited sin, but believe all infants are safe until the age of accountability (age 8-14). The Nazarines believe the same, except they practice infant baptism, (but not to remove depravity). Since they believe baptism removes depravity, and depravity is transmitted from mother to child, why wouldn't the child of a mother who was baptized be born without depravity? Definition: Baptizing someone without their consent, knowledge or understanding for the purpose of forgiveness of sins and saving them from the wrath of hell. At what age do they stop forcing people to be baptized? If baptismal regeneration saves infants who neither believe or consent, why won't it save adults the same way? Why not force masses of unbelievers at gunpoint to be baptized? Why doesn't a priest sprinkle his "holy water of baptism" at the crowds in the city centre on main street? When a Catholic dies, a priest sprinkles water on the dead man and says a formula of words which forgives all his sins and ensures he will go to heaven. All this to a dead man! The idea of certain men (priests and pastors) being qualified to perform marriages, baptisms, absolutions, communion, forgiveness of sins through confessional, while others are not is another false doctrine. The implication is that your baptism's validity is based upon the faith, qualifications and position of the one who baptized you. Again a mix of faith by proxy and the principles underlying baptismal regeneration. Confirmation is usually performed with "Holy Chrism" (olive oil) being anointed to the forehead in the sign of the cross. The official may also give the person a slight blow on the cheek to remind him he must be ready to suffer everything. B. Confirmation is not a Christian doctrine! Notice that the Catholic church actually admits that Confirmation is not taught in the scriptures! 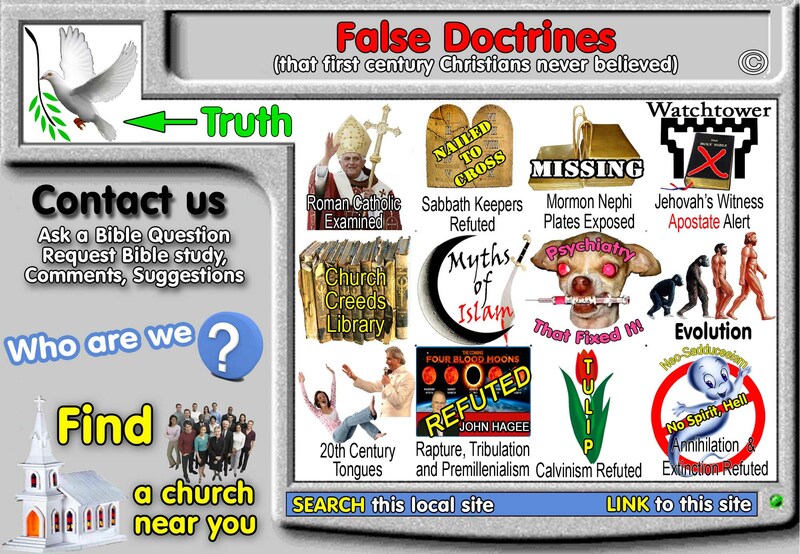 Note: There are a wide range of false doctrines that have been taught about Mary, the mother of Jesus because of the false doctrine of inherited sin. Jesus was God become flesh, born of a woman-a man: Jn 1:14; Gal 4:4. Inherited sin advocates had to explain why Jesus didn't inherit the sin of Adam. Britannica #11, "Mary" pg 562, "Attempting to prove the universality of sin against Pelagius,... Augustine (354-430AD)...wrote "We must except the holy Virgin Mary. Out of respect for the Lord, I do not intend to raise a single question of the subject of sin. After all, how do we know what abundance of grace was granted to her who had the merit to conceive and bring forth Him who was unquestionably without sin?" Council of Trent, decreed in 1546 AD, "The doctrine of the conception of all men in sin was not intended to include the Virgin." In 1708, Pope Clement XI appointed a festival in honor of the immaculate conception. On Dec 8, 1954, Pope Pius IX, Official Papal Decree before 200 bishops in St. Peter's Cathedral, "It is proclaimed by the authority of our Lord Jesus Christ and the blessed apostles Peter and Paul and in our own authority that the doctrine which holds the blessed virgin Mary to have been, from the first instant of her conception, by a singular grace and privilege of Almighty God, in view of the merits of Christ Jesus the Saviour of mankind, preserved free from all stain of original sin, was revealed by God, and is therefore, to be firmly believed by all the faithful." Noll and Fallon, Father Smith instructs Jackson, 1960, "When, in eternity, the Son of God willed to become man, He evidently thought of the one from whom He would take His flesh and blood. She must be as worthy of her dignity as a creature could be. Hence at the moment He would create her soul, He would apply to it the merits of His atonement and preserve it from original sin." If Mary didn't sin, why couldn't she have died on the cross and been our saviour? Assumption Of Mary means she was taken directly to heaven in body and soul without physical death. "Assumption" in scripture: Enoch: Gen 5:24; Elijah: 2 Ki 2:11; Jesus: Acts 1:9. Yet the Bible is absolutely silent on the "assumption" of Mary and is therefore "unscriptural". On Nov 2, 1950 Pope Pious XII declared, "Wherefore, after we have unceasingly offered our most fervent prayers to God, and have called upon the Spirit of Truth, for the glory of Almighty God who has lavished His special affection upon the Virgin Mary, for the honor of her Son, the immortal King of the ages and Victor over sin and death, for the increase of the glory of that same august Mother, and for the Joy and exultation of the entire church; by the authority of our Lord Jesus Christ, of the blessed Apostles Peter and Paul, and by our own authority , We pronounce, declare, and define it to be a divinely revealed dogma: that the Immaculate Mother of God, the ever Virgin Mary, having completed the course of her life, was assumed body and soul into heaven." With all the above taken into consideration, now we understand the reasons why Catholics pray to and worship Mary. Although they deny such with their mouth, by their actions, they worship Mary. Again it must be said that the Catholic position, although repulsive to some, is actually entirely consistent within the doctrine of inherited sin. They merely took it to its logical end. The 4 other points of Calvinism are direct outgrowth of inherited depravity. Limited Atonement: Christ did not die for all men but only those on the "saved list"
Perseverance Of The Saints: A child of God once saved, cannot be lost. B. These points are logical, required and interdependent. Inherited sin was Calvin's starting point in developing his 5 point "TULIP" system of false doctrine. It must be stressed that if someone believes any one of the 5 points of Calvinism, he must accept them all or reject them all, there is no in-between.